Kathryn Ethel Merker has been a pioneer as a woman in what at the time was a man's world of professional music. She has played with major orchestras, in sessions with recording artists, shows, and jingles and has taught at several universities. The diversity of her work is astounding. She helped design the Holton Merker-Matic horn and has been a clinician and spokesperson for Holton, now Conn-Selmer. She studied piano first, then and started playing horn in the third grade. She studied with Max Pottag through high school and then at Northwestern University, where she earned BME (1946) and MM (1947) degrees. She free-lanced in Chicago and was principal horn in the Chicago NBC Radio Orchestra (1941-50), where she was the only woman and one of the youngest members. 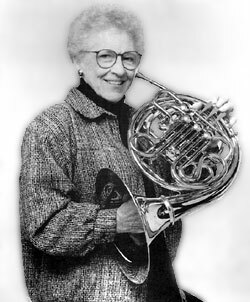 In the late 1950s, Ethel Merker bought her "umpteenth" Geyer horn. In this picture, she is trying it out under the watchful eyes of the maker. Ethel has also played with the Chicago Symphony, Chicago Pops, Chicago Lyric Opera, Milwaukee Symphony, Berlin Radio Orchestra, New York City Ballet, New York City Opera, and the Boston Pops, and in shows in Las Vegas. Ethel has recorded with the Jackson Five, Barbra Streisand, Diana Ross, John Denver, Peggy Lee, Johnny Mathis, Mimi Hines, Ramsey Lewis, Curtis Mayfield, the Smothers Brothers, and Quincy Jones. Peggy Lee insisted on having Ethel in her orchestra and Johnny Mathis called her his favorite horn player. At the Universal Studios in Chicago, a set-up called the Ethel Merker Flying Wedge put Ethel in front, with two trombones, three trumpets, four woodwinds, five rhythm, six violins, and seven low strings. Jingles include Marlboro, Coca-Cola, McDonald’s, Budweiser, and United Airlines. She has been on the faculty of Indiana University, DePaul University, Vandercook College of Music (Chicago), Northwestern University, and Valparaiso University. Students include Dan Phillips, Randy Gardner, Herbert Winslow, Jack Dressler, Eric Terwillinger, and Oto Carillo. Ethel believes in exposing students to all types of music. Vandercook College conferred an honorary Doctor of Music degree on her in 1995. Ethel was a colleague of Philip Farkas, assisting him in the Chicago Symphony on many occasions. 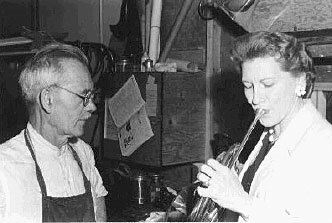 They often discussed horns and horn design, and Farkas took her along to the Holton Elkhorn, WI factory to play and listen to the horns he was developing. In 1995 the owner of Holton, Vito Pascucci, asked Ethel to help produce a new horn design. Ethel worked with engineer Larry Ramirez to develop the Merker-Matic. Ethel has participated in horn workshops and symposiums as a Holton clinician. She was presented with the International Women's Brass Conference Pioneer Recognition Award in 2001 and was elected an IHS Honorary Member in 2009.